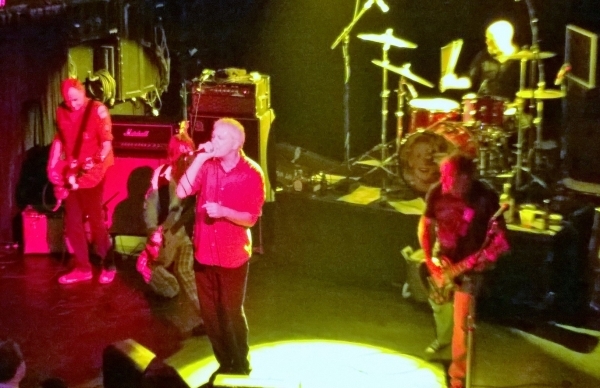 See Guided By Voices before you die. If you already have, see them again. Any GBV show is bound to be life-changing. It’s about witnessing one of music’s most devout fan bases in motion; it’s about experiencing bawdy frontman Robert Pollard’s signature onstage banter; but most of all, it’s about absorbing the vigor and passion of one of history’s most prophetic bands. Guided By Voices’ setlists contain just under 50 songs (each track is usually around two minutes in length), and shows include a whopping three encores. No matter what stage they exit from, a relentless crowd will always be hungry for more, chanting “G-B-V! G-B-V!” Their ubiquitous following includes Pearl Jam’s Eddie Vedder, director Steven Soderbergh, and former White House Press Secretary Jay Carney. The Dayton, Ohio quintet’s recent Irving Plaza gig was fantastic and breathtaking. They tumultuously rocked the stage for two joyous hours. Robert Pollard wasn’t exactly a Marvin Gaye, but he belted with great vitality and he didn’t forget a single lyric - despite being balls drunk on Bud Light, Cuervo, and Crown Royal. The raw, noisy instrumentation was nowhere near, say, Return To Forever’s skillfulness, but the chord progressions and drum beats were tight, catchy, and awesome. The 1,000+ crowd - which contained a bunch of 20-something hipsters and greying indie dads - worshipped GBV. Hundreds of people belted along with Pollard to tracks from throughout the band’s 31-year-long career, including cuts off of classic LPs like Bee Thousand and Alien Lanes. The attendees were utterly overjoyed. How have Guided By Voices been able to generate such a religious following and become so legendary and prolific? It’s because of their spirit. Along with their gritty punk attitudes, the souls of Robert Pollard, Tobin Sprout, Mitch Mitchell, Greg Demos, and Kevin March all ineffably blend together, summoning intense power and beauty.